Monday March 10th 1902 It was a cloudy unpleasant day. I was busy about the work all forenoon and in the afternoon fixed my old green dress some. I read in the evening. 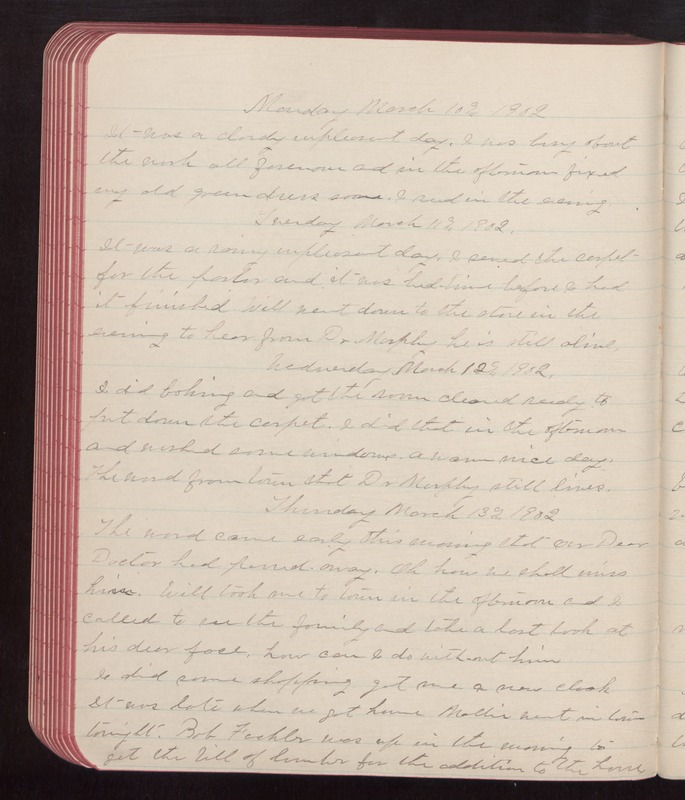 Tuesday March 11th 1902 It was a rainy unpleasant day. I sewed the carpet for the parlor and it was bed-time before I had it finished. Will went down to the store in the evening to hear from Dr Murphy he is still alive. Wednesday March 12th 1902 I did baking and got the room cleared ready to put down the carpet. I did that in the afternoon and washed some windows. A warm nice day. The word from town that Dr Murphy still lives. Thursday March 13th 1902 The word came early this morning that our Dear Doctor had passed away. Oh, how we shall miss him. Will took me to town in the afternoon and I called to see the family and take a last look at his dear face. How can I do without him. I did some shopping, got me a new cloak. It was late when we got home. Mollie went to town tonight. Bob Fichler was up in the morning to get the bill of lumber for the addition to the house.